Sometimes the classic cotton towel just won’t cut it when it comes to getting the clean you want. This is where a microfiber cleaning cloth comes in to play. These handy little squares of magical cleanliness are a godsend for countless things. What makes the microfiber cloth so special? Well, it’s in the name! With so many small fibers built into the fabric the cloth can pick up more grim. There’s a science behind this tool too! The fibers are a type of plastic and when backed by force works almost as a sort of magnet to pick up dust and dirt. 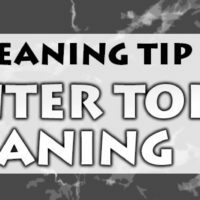 One of the neatest things about microfiber cloths is that they work great all on their own, meaning you can leave behind toxic cleaning chemicals. If you do need a little moisture you can give the cloth a nice splash with some good ole’ H2O and that should do the trick. To really see how amazing this cleaning tool is we recommend using it on chrome, stainless steel or buffing out granite. Microfiber towels are one of our favorite things to use to really get things shining. If you don’t have one yet you can grab one off Amazon, they’re pretty inexpensive and certainly worth the investment! Good tip, I see more and more people recommend microfiber rags. They just don’t seem to absorb the same way as cotton. Agree they are good for polishing, I just cant get used to them for general cleaning. Yeah, I use that same kind of cloth for cleaning services and its the best fabric. We like using micro-fiber towels for screens and more sensitive items like that, but when it come to cleaning a toilet or other wet surfaces we prefer cotton. Each type sure has its place in the cleaning arsenal and both should be used to provide the client, or whoever, with an exceptional clean! You have shared the helpful tips. My favorite cleaning ingredients are DIY natural cleaner. I always try to my home because it is natural and non-hygienic and always eco-friendly. Thanks for sharing this post. Having the right tool for the right job can certainly help things go faster. Thanks for sharing such a wonderful article with us.